Before you purchase and use Alibaba Cloud products and services, you must have an Alibaba Cloud account. And then configure the account. Two types of Alibaba Cloud accounts: individual accounts and corporate accounts. Alibaba Cloud provides the same services to individual accounts and corporate accounts. Go to Alibaba Cloud website. Click Free Account in the upper right corner of the page. Note: You must select the country in which your mobile phone number and credit card are registered. Enter an email ID, which is used to log on and receive notifications. Use email. By default, this option is selected. Click Send to send a verification code to your registered email ID. Enter the verification code in the box, and click Verify. Click Use phone instead to change the verification method. 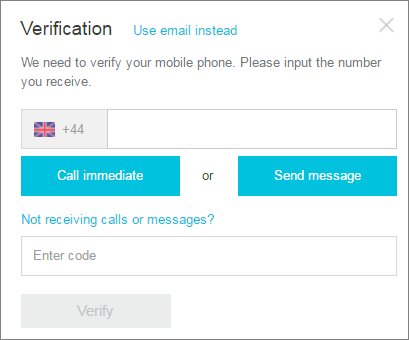 Enter your phone number, and click Call immediate or Send message to receive the verification code. Enter the verification code in the box, and then click Verify. 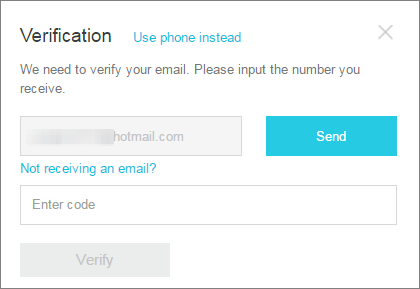 Note: If you choose the email verification method, you have to use the phone verification method when adding billing address, and the other way around. Now you have an Alibaba Cloud account, and you must Add billing address and Add payment method before you purchase Alibaba Cloud products and services. If you want to purchase products and services in the regions of mainland China, you must finish Real-name registration.